Bud Powell in top form with an all-star trio! 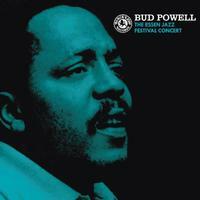 Pianist Bud Powell can be heard in prime form during this live set from The Essen Jazz Festival Concert, recorded in April of 1960. The set finds Powell backed by an all-star trio, featuring bassist Oscar Pettiford and drummer Kenny Clarke. The great tenor Coleman Hawkins joins the trio for three of the nine selections, including an incredible take of his own composition, Stuffy. The classic concert was remastered at Infrasonic Mastering and pressed on audiophile-grade vinyl at Pallas in Germany.